Objectives—The aim of this study was to examine the quality of handover of patients in the resuscitation room by describing the current perceptions of medical and ambulance staff. Methods—This was a descriptive survey using two anonymous questionnaires to gauge current opinion, one designed for medical staff and the other for ambulance staff. 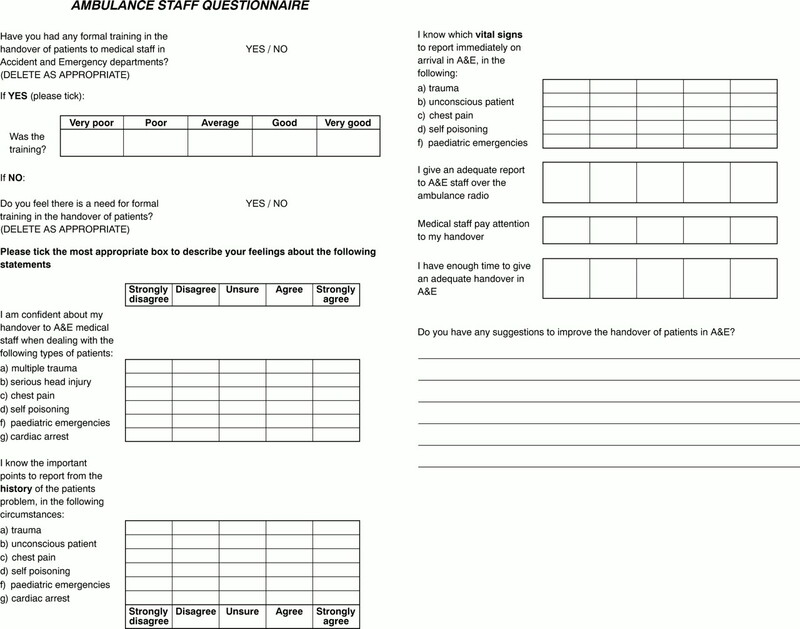 Questionnaires were distributed to medical staff in two teaching hospital accident and emergency (A&E) departments and ambulance personnel in the Tayside region of Scotland. Results—30 medical and 67 ambulance staff completed questionnaires. Some 19.4% of ambulance staff received formal training in giving a handover, 83% of the remaining felt there was a need for training. Medical staff conveyed their belief that handovers were very variable between crews and that they did not feel radio reports were well structured. Ambulance crews felt that medical staff did not pay attention to their handovers. 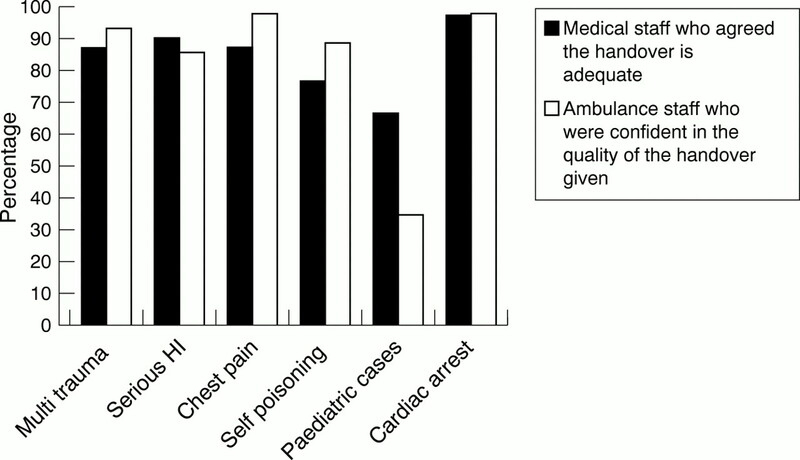 Ambulance staff seemed satisfied with the quality of their handovers, although medical staff were less positive particularly in the context of self poisoning and chest pain. Both seem to be least confident with regards to the handover of paediatric emergencies. 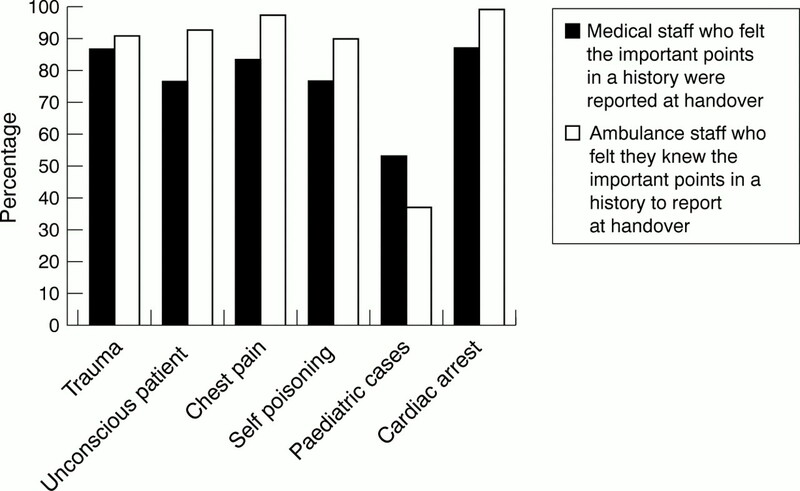 Medical staff were generally less satisfied with the reporting of vital signs than the history provided. Conclusions—Despite a generally positive perception of handovers there may be some room for improvement, in particular in the area of medical emergencies. Ambulance staff training should produce a structure for the handover that is recognisable to medical staff. The aim being a smooth and efficient transfer from prehospital agencies to A&E staff. The management of patients in the resuscitation room of emergency departments has been the focus of several life support courses, dealing with trauma, cardiac arrest, medical emergencies, and paediatric emergencies. The aim is to provide speedy, focused intervention in an organised manner to reduce morbidity and mortality. The quick dissemination of information from prehospital staff to medical staff is essential to achieving this end. The handover of patients is a stressful event as it may happen in the middle of resuscitation. Anecdotal accounts are often produced by medical and ambulance staff to illustrate perceived inadequacies in the process. However, the adequacy of this interface has not previously been studied in the United Kingdom. The aim of this study is to examine this aspect of patient care by describing current perceptions of medical and ambulance staff. This was a descriptive survey using two questionnaires to gauge current opinion. 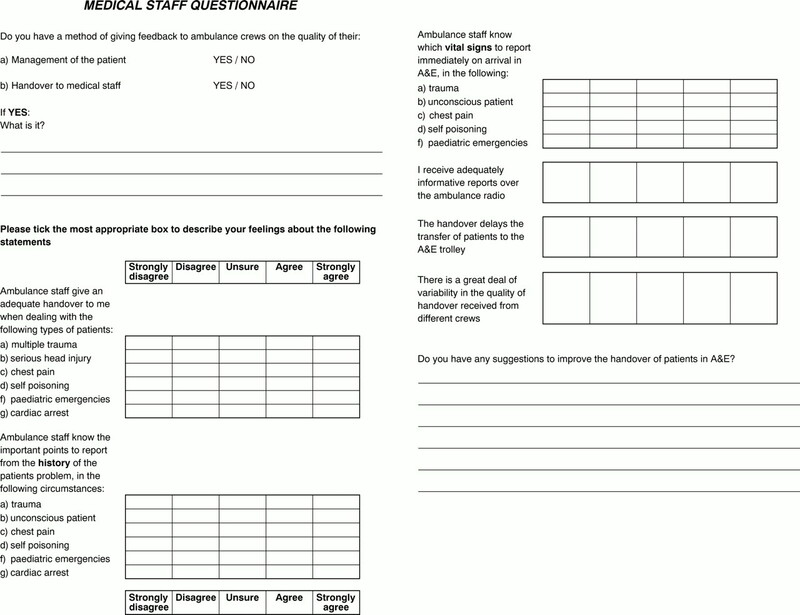 The first questionnaire was designed for medical staff to complete and the second was for ambulance staff. The questionnaires were completed anonymously. A single abstractor who was unblinded to the purpose of the study extracted the information. Questionnaires were distributed to all 47 medical staff in two teaching hospital accident and emergency (A&E) departments, seeing a combined total of approximately 120 000 new patients per annum (appendix 1). They were also distributed via ambulance officers to all 110 ambulance personnel in the Tayside region of Scotland (appendix 2). The questionnaire asked ambulance staff if they had received any formal training in the transmission of information to colleagues, and about their confidence in handovers in a number of different clinical situations. Medical staff were asked their perception of the handovers given by ambulance staff in the same clinical situations. They were also asked if they had any opportunity to feedback their opinion to ambulance staff. The clinical situations enquired about included, multiple trauma, serious head injury, chest pain, self poisoning, paediatric emergencies, and cardiac arrest. Opinions were asked regarding other aspects of the handover, these were; the perceived quality of prehospital radio reports, that handovers delay patient transfer, the quality of handovers vary a great deal, medical staff pay attention to handovers, and enough time is available to give an adequate handover. Questions relating to confidence had set responses. These were categorised into five groups, namely, strongly disagree, disagree, unsure, agree, and strongly agree. In total, 30 medical and 67 ambulance staff completed questionnaires representing a 64% and 61% response rate respectively. The response to general questions regarding the handover, in different clinical situations, is shown in figure 1. Figures 2 and 3 show the responses to questions of confidence in the quality of history and vital signs provided by ambulance staff. All figures present the percentage of respondents who agreed or strongly agreed with the statement posed in the questionnaire. The perception of the handover seem positive among both groups. 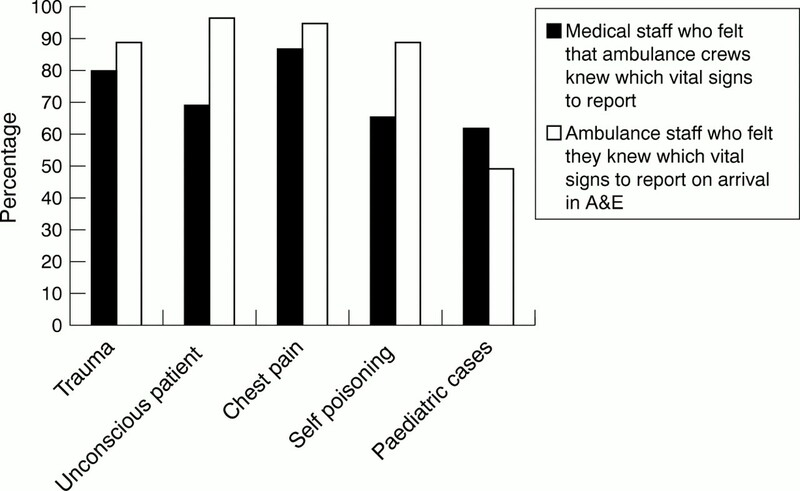 Medical staff were slightly less positive about handovers, particularly in the context of self poisoning and chest pain. They were also generally less positive about the quality of vital signs reported during a handover. General perception of the handover given by ambulance staff. Perception of the quality of history given by ambulance staff. Perception of the quality of vital signs given by ambulance staff. Sixty nine per cent of medical staff felt that the quality of handovers varied a great deal between ambulance crews. Some 65.5% agreed that prehospital notification was used appropriately, but only 35% agreed that radio reports were well structured. Only 17% of medical staff felt that the handover delayed the transfer of patients onto the trolley in the resuscitation room. Some 89.4% of ambulance staff were confident about which cases to notify in advance and 83.3% were confident about their ability to structure a radio report. Altogether 72.7% felt they had enough time to give an adequate handover but only 24.2% felt medical staff paid attention to their handovers. Ten (33%) of medical staff felt they were able to give feedback to ambulance crews on their management of patients en route to hospital and seven (23%) felt able to give feedback on the handover received. Thirteen (19.4%) ambulance staff received formal training in giving a handover. Of those who did not receive training, 44 (83%) felt there was a need for training. It is encouraging that both groups have a generally positive perception of the handover process. The opinion of medical staff with regard to the handover in medical emergencies is slightly less positive than ambulance staff. This may indicate a need to improve training of ambulance crews in acute medical emergencies. There is a notable lack of confidence in both groups regarding paediatric handovers. This may be explained by the added stress of the situation and also by the fact that they are less commonly seen However, medical staff are more positive about the quality of these handovers. It is therefore unfortunate that there does not seem to be a system in place to allow feedback to ambulance crews. Such a process may improve the confidence of both groups. Ambulance staff report a lack of formal training in giving a handover, a view apparently confirmed by medical staff conveying their belief that handovers were very variable between crews and that they did not feel radio reports were well structured. However, the validity of medical staff opinions may be questioned as it seems ambulance staff do not feel that medical staff listen to their reports. The probable reason for this is that medical staff are distracted by their desire to start assessing the patient. One solution is to listen to a handover without anyone touching or talking to the patient unless they had an immediately life threatening problem. Alternatively a member of the receiving team could be nominated as the person who takes the handover while others continue to treat the patient. There have been no previous studies into the handover between ambulance and medical staff in A&E. This study has some limitations, firstly, the abstractor was unblinded to the purpose of the study. The findings are based on questionnaires rather than actual handovers and are therefore a collection of opinions. Direct observation of the handover in the form of audio or video recording would be an alternative. However, the presence of such equipment would change the behaviour of staff and hence potentially bias any results. This questionnaire based study highlights perceived problems that are important to appreciate when starting to investigate this area. Although the number of subjects is small, this study gives an initial picture of current problems and provides the basis for further studies. A better, more consistent structure to the handover will improve the dissemination of information in all types of emergency. Ambulance and medical staff training should be based around a system where patient details are followed by a concise history of the events, general medical condition and salient physical and vital signs.7 The aim being a smooth and efficient transfer from prehospital agencies to A&E staff. Shobhan Thakore initiated the study hypothesis, developed the questionnaire, collected the data, analysed the data and wrote the paper. William Morrison contributed to the study design, edited the paper and is the guarantor of the paper. Thurgood G. Verbal handover reports: what skills are required? Br J Nursing1995;4:720–2. Sherlock C. The patient handover: a study of form, function and efficiency. Nursing Standard1995;52:33–6. Roughton VJ, Severs MP. The junior doctor handover: current practices and future expectations. J R Coll Physicians Lond1996;3:213–14. Morrison WG, Pennycook AG, Makower RM, et al. The general practitioners use and expectations of an accident and emergency department. J R Soc Med1990;80:237–40. Gerndt SJ, Conley JL, Lowell MJ, et al. Prehospital classification combined with an in-hospital trauma radio system response reduces cost and duration of evaluation of the injured patient. Surgery1995;118:789–96. Yamamoto LG, Wiebe RA, Maiava DM, et al. A one-year series of pediatric prehospital care: I. Ambulance runs; II. Prehospital communication; III. Interhospital transport services. Pediatr Emerg Care1991;7:206–14. American College of Surgeons. Advanced Trauma Life Support Manual. Chicago: ACS, 1997.